According to IRS statistics, their collection department sought more than $26 billion in tax debt in 2007. If you owe money to the IRS, you know how quickly the interest charges and penalties add up. Tax debt occurs when you incorrectly filed your taxes or were unable to pay what you owed. As audits often take place years after you’ve filed taxes for the year in question, interest charges easily triple or quadruple the amount you owe. On average, penalties and interest add at least 25 percent to your tax bill. If you owe the IRS any money, they rarely prosecute you criminally, although they can put a federal tax lien against you. This action not only ruins your credit, moreover, it allows them to access your bank account(s) and wages to get the money you owe. If the amount of money is large enough, they can seize your personal property, including your home. If you receive a tax bill and believe that there is a mistake, contact the IRS. They are human and have been known to make errors. Send a letter submitting proof that you cannot possibly owe the amount they are claiming, or a letter requesting them to provide you with evidence indicating why you owe the money and how much. Make sure you send these letters certified and keep copies of everything in case you need advocacy. Experienced financial distress caused by a tax issue. Not received any update from the IRS by their deadline. Spent more than 30 days unable to resolve the issue. Every state in the United States has a local tax advocate available. If you have unresolved tax debt issues, contact a tax advocate. Their services are free. In addition, they are aware of the constantly changing laws regarding settling tax debt. To lessen the penalties and interest you are facing with any tax debt, it is important to pay as much as possible. The minute you receive a tax debt bill from the government, you should send as much of a payment as you can afford to remit. Even a small payment can reduce your interest and penalties. After raising as much money as possible, contact the IRS and ask them about installment plans or extensions. Installment plans can be costly because they do not end the late fees and interest charges. However, it’s better than ignoring the situation. When all else fails, a tax debt settlement program may be your best option. Most companies specializing in tax debt settlement require you to owe more than $10,000. 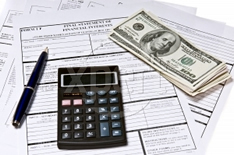 These programs are usually a division of a law firm who specialize in tax debt. They will negotiate with the IRS to reduce the amount of money you owe. Keep a file of all correspondence between yourself and the IRS. Add your tax records to that file, including any payments you may have made. Have pay stubs and monthly expenses ready to prove you are already living on a tight budget. Contact a qualified tax debt settlement program. With tax debt settlement programs, the amount you owe can be reduced, but there are no guarantees. The IRS realizes that they stand to lose a lot of money if they don’t reach an agreement, so it’s always a good option to try debt settlement before filing for bankruptcy.